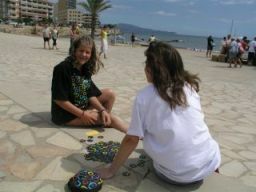 The first "International Festival of Tantrix" was held in the beach town of L'Escala on the Spanish Costa Brava during the summer of 2005. 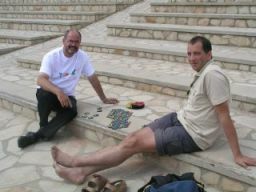 The festival consisted of quick encounter games, an international Doubles Championship, a new Tantrix Spaghetti World Record and the the first Spanish Open. Players from 10 different countries braved the heat to join in on the fun. 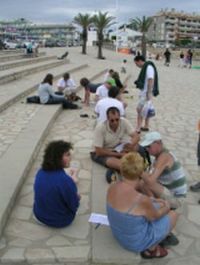 The Catalan Doubles Championship was played on a glorious Spanish evening at the Plaza Catalunya. 16 players entered with a good mix of cross countries represented by eight exotic team names. Francois' team (Bread with oil in Catalan) got off to a good start and was leading by 10 points going into the final match. However the Mala Chicas (Marina and Octavi's daughter Laia) scored an healthy 38 points in their final game and won the title. 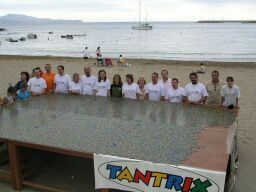 On the third day of the tournament an attempt was made on the World Record for creating Tantrix Spaghetti. The rules for Spaghetti records are fairly simple. 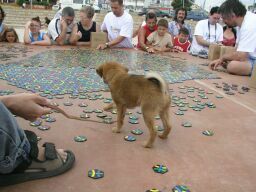 Use as many people as you like, to put together as many tiles as you can! You have a maximum of 12 hours from start to finish, and no colour matching mistakes are allowed. 4 colour tiles must be used in approximately equal quantities (not only 3) and must contain multiples of all 56 tiles. Suffice to say that no previous record attempt would have had as many good players available to help control the public, so not surprisingly the previous record set in Australia was smashed and the new record is now 11,237 tiles. UPDATE - This record was surpassed in December 2006. Details here. 20 players from France, Spain, Holland, Poland, Hungary, NZ, Australia, Sweden, Denmark and Germany entered the Spanish Open during the festival week. The rules were a little more casual than normal - clocks were not used and players were allowed to play whoever they liked with a limit of one game per person, ie nobody could play the same player twice. 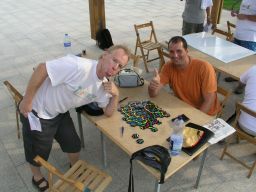 However, only your best 10 scores (TP's) counted and any player completing less than 6 games was disqualified. Flacky, the recent winner of the French Open, dominated the tournament right from the start, winning his first 6 games in a row, and was the overall deserved winner.